I first heard about The Ex somewhere near the end of the 90’s (they started in 1979 so I was late to the party). It wasn’t just their music I fell in love with straight away, but also their single-mindedness to do things their own way. They have no manager, roadie, driver and all their music is released by themselves. It is impossible to describe their music, it might have started with a punk ethic back in 79, but when you have been going for over 35 years and collaborated with the likes of Sonic Youth, Ken Vandermark, Tom Cora and Ethiopian saxophone legend Getatchew Mekurya, you get some idea why. But hearing them live is the real joy for me, there are no big singles, crowd pleasing tunes but you do get this melting pot of sounds that is filled with energy, power and joy. They play with smiles on their faces which is so infectious. 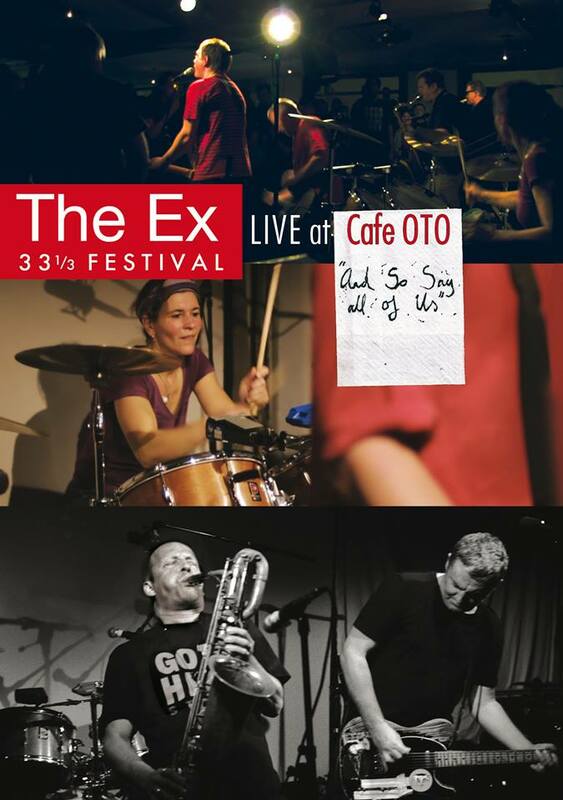 So when Sean Zissou of Practice Tape Collective asked if I wanted to write a review of the new The Ex concert dvd ”And so say all of us, 3 Nights at Cafe OTO” for their 33 1/3 anniversary which they had made, I said yes with a big smile on my face. They are the kind of band that Under the Influence love. Independent, happy to collaborate with others and an amazing live act. Hope you enjoy my review, please buy their music and come to the next UTI night. James Dillon – Co presenter of UTI podcast and sometime tea maker. The Ex: And so say all of Us, 3 Nights at Café OTO. I was there, on the second of three nights to watch the Dutch band ‘’The Ex’’ celebrate their 33 1/3 anniversary with a series of concerts. Thanks to Practice Tape Collective, we have this concert film of their three nights residency in late November in 2012 at Café OTO in Dalston, East London.This film is a great example of what The Ex have been about since their formation in 1979. Their DIY punk ethic, a willingness to experiment with sound and collaborate with others. Plus the sheer joy of watching them play live.The film starts with the band rehearsing ‘’Addis Hum’’(released as a single this year). GV shots of equipment being set up, fans arriving. Then 2min 22sec in, the noise explodes as we cut to the same song in concert. Guitars, trumpets and drums are now up close and it feels like Paul Greengrass jumped behind the camera and you are sucked in. We get more examples of this later on tracks like ‘’Maybe I was the pilot’’, Lale Guma, ‘’State of Shock’’ and the closing track ‘’Theme from Konono No. 2’’. But the film isn’t just about the four members(Andy Moor, Katherina Bornefeld, Arnold De Boer and the only original member from 1979 Terrie Hassels), but also the great musicians they have worked and played with over the years. Tracks four to seven see experimental collaborations from the likes of Mats Gustafsson, the Swedish saxophone player who has played with Sonic Youth, Colin Stetson and Kieran Hebdan. Here sharing the stage with Terrie and Andy from The Ex. This dissolves into Ken Vandermark (jazz composer from Rhode Island), Steve Beresford (British multi-instrumentalist), Wolter Wierbos (Dutch trombonist) and Anne James Chatton the sound poet. Later in the film, we get another four tracks from the likes of Ab Baars, Ken Vandermark and Xavier Charles (all playing clarinet). Two pieces from Australian drummer Tony Buck (founder member of The Necks) and Brighton Saxophone player John Butcher. All of these are shot in beautiful monochrome. A great example of this is 31 minutes in. From a monochrome close up shot of a guitar pedal, there is a sudden wall of sound and we are into the track ‘’Gondar’’ (I believe it is a traditional Ethiopian song). Everyone is playing, the joy and energy while watching is infectious. Half way through the song, two London based Ethiopian dancers Temesgen Melese and Messi join the party and you can’t help smile and bop your head while you are watching. This is where I must mention the filming and editing of Sean Zissou and Dave Knox. They have done a wonderful job of bringing those three nights to life. One minute you see three guitars close up, a crunching sound filling your ears, the next the camera is in/out focus, syncing to the sound of Roy Paci giving everything on trumpet. You feel you have been transported into the café OTO (did I mention I was there?). If you only get one more concert film in your life, please make it this one. This dvd is a real joy to relive a magic three nights with this great band. “And so say all of us” is out now and can be purchase from theex.nl. The Ex play Oslo Hackney Tuesday 19th August then tour the country. See theex.nl for tour details. James Dillon – Co presents a music podcast Under the Influence.